The relationship between picture and sound, as well as live, performative aspect of using the video signal, was by Vasulkas seen as a key aspects of their work. To include the sound was natural: Steina studied violin and Woody was a member of the music band back in Brno where he played the trumpet. Already their first experiments with audio synthesizer revealed that the electronic signal can trigger direct visual analogy, and this deeply influenced their approach to image and sound. Since late 1960s in collaboration with engineers, they started to develop video synthesizers, directly inspired by audio synthesizers. Steina experimented with the principle of "playing the images" in real time her entire life and she developed various, often self-constructed tools. This videotape demonstrates, for its time, a highly complex image calculation, which by today's standards looks simple. Nevertheless, it offers another example, from the early works of the Vasulkas, of how they creatively forced the medium, exhausted the tools, and attempted to exceed the limitations of the machine. Certainly, with the addition of digital tools and algorithms, the dimensional expansion more easily allows transfigurations and reversibility, such as metamorphosis, parallel stream of events in one image field, and image synthesis. With Voice Windows (1986), Steina renews her efforts to generate a complex sound-image interface. She had already attempted this with Violin Power (1970-1978) a video in which she used a specially adapted violin to simultaneously transform the electronic signal and sound wave of a video image. In Voice Windows, Steina experiments with keying video tracks that visually convey the modulations of the human voice. For this experiment, Joan La Barbara, an American singer and composer, provided a repertoire of samples featuring all the registers of her voice. These samples are processed through a software that syntonizes the frequency levels with a secondary video track. This track is then keyed into a primary track whose contour matches the changes of timbre and tone of the voice. At the start of the video, blue lines waver on a black background, denoting the sound modulations. These lines seem to open a gap in the first image, evoking the window from the video's title. Next, a dolly shot on a street replaces a monochrome background, and the track modulated by the voice reveals a second landscape. The continual shifting between these two layers makes it impossible to gain a real sense of depth. Indeed, the keyed track keeps the viewer's eyes on the surface of the screen. Voice Windows is part of a cycle of videos and installations inspired by the New Mexico desert. In these works, the landscape serves as a foundation for experimenting with the features that distinguish electronic images. 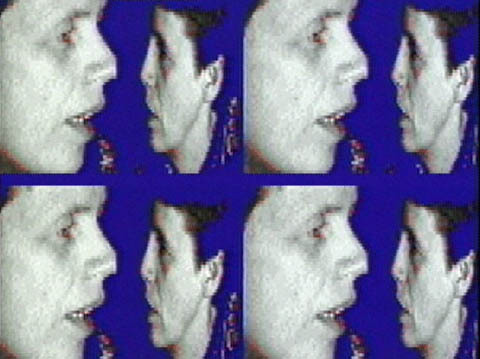 Joan La Barbara used a bank of images taken from Voice Windows in her performance Vocal Window presented in 1987 at Santa Fe's Center for Contemporary Art. In this piece, Joan La Barbara manipulated the real-time video segments using Interactor, a software developed by Mark Coniglio and Morton Subotnick. 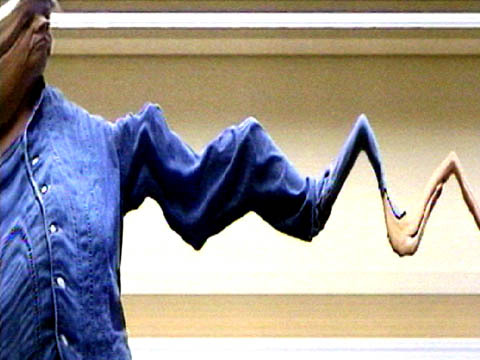 Segments of this performance also appeared in the multi-screen installation Vocalization, created by Steina in 1990. The effects in Warp are produced with the software Image/ine (written by Tom Demeyer) and consist of twisting segments that are "time-warps" and endless multiplication through "slit-scan" processing. What happens in the twisting is an inversion of time into space, because the temporal course of the movements performed are presented spatially, so that we can say time is enveloped, immersed in space. The visual result of slit-scan presents an endlessly multiplied view of Steina that builds up to a multi-perspectival view, not unlike Futurist painting. However, here the sculptural form results from real motion in real time that in slight delay is fed into the digital system and transfigured into a freely moving object in space. It becomes evident that the digital computer emulates the analog. Needless to say, the spatial presentation in itself multiplies when the image sculpture travels through a series of screens. The non-fixity of the digital matrix potential, in a sense, gets frozen and fixed, because the sculptural image form encompasses time and linearity, but does not act it out. It only exhibits the potential of temporal expansion, and it does so in another dimension, which is space. In this regard, the theoretical concept of the digital - to optimally present in simulation any direction and multiple dimensions - has been turned into an aesthetic "perceptual environment." Steina - Violin Power, 1978 from David Peck on Vimeo. In the first closed-circuit audio/video performances of Violin Power (1970 to 1978) the primary effect observed was the actual movements of the bow on the strings of the violin immediately deflecting the image position of exactly this gesture. Besides being the performer, Steina plays the violin and the video so that in intermediary ways the observer and the observed converge. The languages of the two media, music and video, are interconnected according to their abstractness where the sound creates the waveforms of the image. Furthermore, music is visually explored as a medium developing temporal and spatial features: not only does the sound spread the scan lines so that they become horizontally visible thereby exploring temporal dimensionality, but Steina also uses the Scan Processor to modulate the soundwaves until they build up spatial forms of the image. Through the Scan Processor, brighter parts of the "image" are lifted so that the horizontal lines also vertically deflect and create sculptural pattern. While Steina, in the beginning, interfaced the sounds of her acoustic violin via microphone, since 1991 she performs with a MIDI violin to increase the variety of programs: "The Zeta Violin is a five-stringed electric violin with a MIDI output. The assignment at the moment is that stops on A and E string point to frame locations on the disk. The D and G strings control speed and direction and the C string is a master controller assigned to address segments on the disk. In another programming scheme, the C string controls which upper strings get assigned their function, as I experiment to make the performance more musical." While this setting was originally used for performing with a laser disk player, since the late nineties other schemes and string assignments are performed on a PowerBook using the software program Image/ine, developed in 1997 by Tom Demayer at Steim, Amsterdam, in consultation with Steina.